Recruitment and selection can be a stressful and traumatic process for both people and organizations. But how does it feel to actually be involved? Giving a voice to both applicants and recruiters in a unique package, Experiencing Recruitment and Selection uses real-life stories to explore issues such as why people apply for jobs, perceptions of fairness, how failure affects internal applicants, the impact of market forces on decisions, how recruiters select for ‘fit’ and much more. In each chapter Jon Billsberry tackles a particular topic, drawing on at least three related stories and concluding with provocative questions and a guide to further reading. The stories are interwoven throughout with analyses that highlight key lessons. 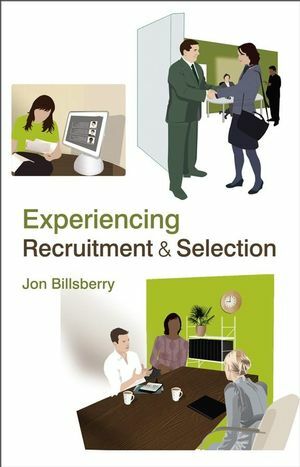 Jon Billsberry is Senior Lecturer in Organisation Behaviour at the Open University Business School and Research Director in the Open University's Human Resources division. he holds degrees from the universities of Manchester, Birmingham and Nottingham. before turning to academia, Jon worked as a financial analyst and an executive search consultant. Currently, his research interest lie in the areas of person-organisation fit, recruitment, selection, leadership, cinematic representations of work and organizational life, innovative methods of management teaching, the future of management education, and psychology o the penalty shoot-out. He teaches organisational across a range of levels, from 'openings' courses through undergraduate and Master's Levels to PhD supervision. Jon is the chair of the Organisational Psychology division of the British Academy of Management, in which role he founded the Academy's Organisational Psychology Special Interest Group, and secretary of the management Education and Development division of America's Academy of Management. education and Development division of America's Academy of Management. He has published three other books. His first book, the effective Manager: Perspectives and Illustrations, is a collection of lively and provocative articles on management. His second, Finding and Keeping the Right People, gives practical advice on how to attract, select and retain high-quality people. His third book produced with John Storey and Graeme Salaman, Strategic Human Resource Management: Theory and Practice, is an up-to-the-minute collection of articles on the current state of human resource management. PART I: The Selector’s Perspective. PART II: The Applicant’s Perspective. Chapter 13: Case Study: The Prison Service Assessment Centre.